ADDA was a pioneer about public campaigns. Our entity use to teach to the community about different subjects of cruelty towards animal. Some of these campaign were: against the animal use in spectacles, circuses and similars; against the indiscriminate sale of puppies; against the shot of doves; against the vivisection; against the slaughter of whales; against the bullfighting celebrations in foreign countries, and to prevent them in our nation; etc. 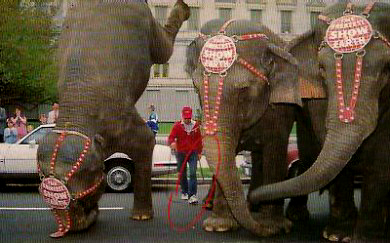 Circuses and other spectacles are areas where the slavery of the animal is more evident. Everything that we can analyze as far as the very sad life of animals working in circuses, with the training and the transfers, comes a subsequent of that great sin which is to deprive of a wild being of its natural surroundings and its possibility of living with those animals of its same species and exercising its natural behavior. Although in the circuses usually work domestic animal like dogs, these never get to suffer so much as the wild species. Years back the circuses were the unique spectacles that arrived to small towns of a province and few people would have been happened to question the slavery of the animals that the circuses brought with it. Now people can choose circus without animals as Circus Du Soleil that crosses the world with fantastic spectacles. In 1995, after an investigation that ADDA did on the Rhodes Circus, in Buenos Aires the organization could present a criminal denunciation by cruelty towards the animal, consequently ADDA obtained that Justice confiscate all the animals that Circo Rhodes had. The animals were transferred to the Zoological Park of Buenos Aires. A very mistreated animal was Mara, a female elephant and the chimpanzee Junior. The mentioned circus, without its animal was forced to close its doors. CIRCUS ARE PROHIBITED IN THE CITY OF BUENOS AIRES. During 2004, by means of an ADDA project signed by other protectionist organisms too, the Government of the City of Buenos Aires prohibited the entrance and the performance of circuses with animal in the City of Buenos Aires.